Angelini, Josephine. Dreamless. 487 p. 2012. HarperTeen. Hardcover $17.99. ISBN 9780062012012. I had a blast reading Josephine Angelini's Greek mythology inspired debut novel, Starcrossed, last year. Talk about addictive-- I couldn't put it down! And I can safely say that fans of the first volume will absolutely eat up this action-packed sequel. 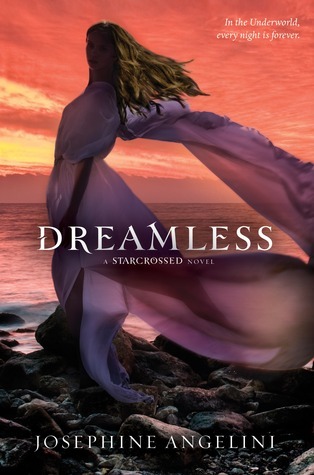 Dreamless builds on the foundation set in Starcrossed and continues its complex storyline-- essentially a modern retelling of The Iliad with some twists. The book maintains an epic feel as Angelini, one of the most organized and focused writers I've encountered, juggles several plot threads in a seemingly effortless manner. The plot is propelled forward at a consistent pace, with no lulls in the action. It's fun to revisit the same characters we fell in love with in its predecessor (I heart Helen's feisty best friend Claire! ), and meet some dynamic new characters in this book. Romantic tension is heightened as Helen and Lucas are still forbidden to get too close, and a possible new love interest is introduced in the form of Orion, another Scion who joins Helen in her nightly visits to the Underworld. Speaking of the Underworld, Angelini's vivid descriptions of this realm will set your hair on end. Not a place you'd want to get stuck in! On the other end of the spectrum, there's an exquisite scene with Morpheus, the god of dreams, that's so beautifully written, you might want to read it again and again. Look for Dreamless in bookstores everywhere on May 29th, and visit the Authors are ROCKSTARS! podcast for an interview with Josie! ARC for review generously provided by HarperTeen. I understand what you mean Allison ;D This book felt so real to me!!! 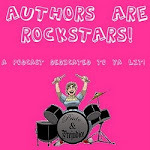 I love the blog by the way, and the review!